Love never dies because of natural causes. Thank you, Ralph! I hope you are doing well. It feels good to be back and will be visiting your blog soon. I think it sounds right. I mean, it was a huge thing. Tiring, stressful, lots of planning, expectations not met, and then yes, it sounds like you might have been the kind of couple for whom a weekend of wedding would have made it easier to connect to others. I think you’re doing it right. Enjoy your husband. Revel in one another, and your new union. I had a small (and crashed) wedding, and a short honeymoon. We both wish we had eloped, so not quite the same thing, but one day we shall have an enormous anniversary party. We shall celebrate us with the people who’ve actually supported our marriage. We shall hire a bouncer! Maybe in your thank-you notes, you could mention you wish you’d been able to visit more and offer invitations to lunch or dinner, for the first time as a married couple. Thank you, Joey. To have a “crashed” wedding sounds like it may have brought on its on intensities. To have a huge anniversary party with people who’ve supported you both sounds like it would be incredibly amazing. And love the suggestion for the notes. It is totally natural to miss the actual wedding and especially natural to focus on the “what went wrongs!” That being said, don’t worry about all those teeny moments that no one but you notices. It is fantastic that you focused so much time on tying to spend time with all the guests and I am sure they appreciated that. But they also know that the day is about you and your husband, not about spending quality time with them. They came to celebrate your union, and (most) wedding guests don’t get offended if they don’t get to have an hour of catch up with you. It is a drastic change when you go from full wedding planning mode to just being married. Your focus shifts back to each other again — and that is something to savor! A trip is a great idea to get that focus back, if you have the time. Thank you, that’s great advice. We went on a short honeymoon Part I that definitely took the edge of. Our official hm Part 2 is definitely something we are looking forward to. It’s funny- a close friend of mine got married this past weekend and we both laughed cuz she was the one now sweating the small stuff and I was the one saying I had no idea what she was talking about. Thank you for the good wishes! Dear Diahann, First of all, FELICITATIONS!! Thank you so much for sharing all of this. You have been on my mind and in my heart these past weeks and I have been wondering how you are, as well as how the festivities went. Your wedding sounds, not surprisingly, wonderful, beautiful, memorable…like you. And I so admire your wisdom in processing the bounty of emotions involved–in the commitment to each other, and also the production, including all of the emotions of those around you. Your harping on the minutiae of what went “wrong” makes me laugh, reminding me of my own laments even thirty-plus years later. I still cannot believe that I spoke with so few of the guests, except for the ridiculously long receiving line. Even worse: Unlike you, I missed a lot of opportunities to be with my amazing husband. Good grief! What was I thinking?! I wonder if the blues come partly because the big day is so exciting that it’s hard to match the rest of real life with that day? Emotions run so high and there’s so much energy. It’s hard for everyday life — even honeymoon life — to compete. So there is some sense of letdown? I wish the best for both of you! Thank you, Georgia! I definitely agree that’s part of it- it really is some altered state you get on and then the crash back into real life. It would probably be easier to navigate the day itself if it all wasn’t so surreal and new. Thanks for the good wishes! Hi Lorien, hearing a bit about your story, Joey’s story really makes me think how there are probably so many gorgeous, unique tales about wedding days- and I’m sure having a baby on the way added a whole different dimension. Thank you! I’m glad the day was exceptionally special for both you and hubby. I’m certain you all enjoyed yourselves as one big party. That’s how people will remember it. Happy memories while you ride on a cloud into the future with hubby. Thank you, Jean! I think you are right. One of my dearest friends got married this weekend and it was her turn to be so busy during the whole event- yet just being there with her and husband, both so happy, made my evening. What an amazing, and completely unexpected, after effect! You know, I don’t think I’ve ever heard anyone I know talk about this after-wedding excitement joyful dearth, so to speak. I can certainly understand it, especially with your usual ability to convey thoughts, but despite your brilliant desire to embrace it as part of the process, I would have wished another after-party path for you. Still, I love that you re-claimed happiness in a term… cheers to you, Wife. So tender. Makes me wish I’d paid more attention and given the ‘event’ of my wedding more respect. At the time, for me, a party was a party. 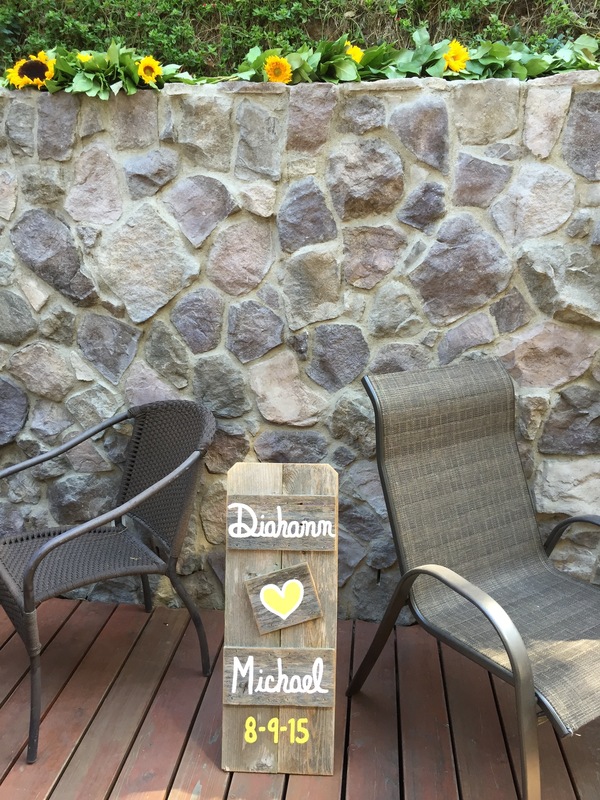 DIahann, i’m sorry you and Michael have struggled with these post-wedding blues. I can relate to the experience, not from having a wedding, but from having had an experience that made me feel so high afterwards the contrast of my “ordinary” life was too much and I, too, feel very depressed. I am learning that it’s a natural phenomenon, just as you write in your piece. I am also learning it’s good to keep creating things to look forward to so that as time goes on the contrast with that one day is no longer so overpowering. Yes, the feelings, as you say, are meant to be felt and sung. Also remember your wedding day is just one of the many best days of your life the two of you will have together. I wish the two of you much continued love and joy and happiness. May the blues soon pass and the joys become obvious again. Much love to you. Thank you for the wisdom, Audrey, truly. lol- this phase should therefore be very productive and creative for me. U know, when writing the piece, I kept thinking how these blues are not too different from when one has a big performance they are looking forward to, they spend weeks, months working on it, and then after the high of opening night/the reading- there’s the crash and drop. Would you say? Yes, Diahann, I agree. I have experienced that high, crash and drop in relation to preparing for and doing a reading. the experience itself is such a high and then afterwards I have felt like I have no footing. And then there is something else exciting to do or prepare for and the whole process start again. I think it’s important to give space to all of it, the anticipation, the excitement and high and the blues because it seems to be part of our experience as human beings. Of course the blues still feel crummy, but if we know they are okay to feel and move through and that we will move through them as we have done before, it makes them a little easier to bear. Lots of love to you and Michael!! Congratulations Diahann and welcome back, I’ve missed your essays. Regards Mark. Thank you, Mark. It’s great to be back and looking forward to diving back into our community again. Congratulations… Now you are free to give up on Feminism! 😀 ((Joke!).. Thank you, Aquileana! You made me laugh with your joke. I think, if anything, my marriage and who I’m with will likely enhance the feminist side of me. Congratulations!!!! The wedding is over and that’s a good thing. The wedding is just a day. Now you have a marriage, and that’s a lifetime of them. Thank you, Jay. That’s great perspective and wise words. I enjoyed ‘singing’ the blues with you, and you sound just fine to me. “So why not embrace this as part of the process and make space for it?” Yeah, totally yeah! Thank you, Timi. Yes, despite the blue notes this period has been sublime. I am going to say something controversial here and it’s not meant to offend anyone. But sometimes arranged marriages, not coerced mind you, can make sense too. With getting married love of your life you might think oh wow maybe I already know him too much or her too much. And you feel marriage is “endgame” and not a new possibility. In arranged marriages there is still that spark of knowing someone. And you know arranged marriages also has the anxieties of knowing someone. So both marriage types and romances are valid. One cannot be stigmatized or the other valorized. For me the arranged marriage has that anxiety of what he/she is not the right person and what if I got myself into a bad commitment. I think even when marriage to a known partner happens that’s there. It’s human. But in romance I do not know marriage feels so much like an “endgame” I mean there will be a next there are a lot of cool things you can discover about each other. better yet the things you did discover you can transmute that into new discoveries and combinations. I think as societies put a lot of pressure on marriages we are also pressurized. The thing is I feel not to be perfect from the start but to reach perfections and lovable imperfections as you go along with both passion and patience. And you know I think that’s important. Really appreciate your perspective and thank you for sharing. I definitely have read that there can be advantages to arranged marriages. Makes me think how much our own mindset/culture impacts how we view relationships and commitments. I’m not at all surprised that “post-wedding blues” is a thing (which is not to say I’m glad to hear you’re struggling!). I think it’s challenging, with any experience billed as “the happiest day of your life,” to just let your feelings be what they are without double-checking: “but was I happy *enough*? was I the right kind of happy?” My friends who are mothers have often said something similar about meeting their child for the first time.Yes, magical. Yes, momentous. And also: no, not everything becomes immediately different. Sounds like you are taking the wisest course possible, in making space to feel…however you feel. Also? As I understand it, many of these marriage things are a kinda long-term commitment. Which means maybe you renew your vows every so-many years — and you can adjust who you talk to and what you do at your wedding as many different ways as you like! Alice, I love that idea- we will have to renew our vows and celebrate for sure – perhaps a 5 or 10 year one although I doubt most folk who came the first time will be compelled to show up again. Thanks for bringing up the point that this type of blues may resemble a type of post partum in its own way. I had been thinking that as well. I am a big believer that feeling our emotions esp the ones we want to release creates space for the yummy feelings and definitely feel like it has done that as well. Hopefully the joy we feel has also come through. I was so glad to see a wedding post from you, though I wish it were less a lament (while I enjoyed the meaningful humor). You’re right. We do need to allow ourselves to process change as well as regret. You and Husband obviously communicate well to be able to support each other in this regard. You do have to move on, though, as you know. The things that don’t go right in weddings are endless to be able to recount and recapture in disappointment. The botch-ups at mine were so big I had to let them go right away or I’d be too upset. Lol Diana- am definitely not pregnant although your observation that my symptoms might be that did make me laugh. It doesn’t surprise me, knowing what I do about you from our exchanges, that you would set your mind to let go of the botch-ups right away – although as someone told me, what the bride and groom notice didn’t go right, most people at the wedding never even see. But yes- onward, as time, to quote a cliche- waits for no one. And as you said- or to paraphrase/infer from your last sentence- the best part of the day- the marriage, goes with us. 1. They were such big no-nos no bride could forgive (Type-A Yours Truly esp) that I had to or I would DIE. Forgive or bust. 2. “what the bride and groom notice didn’t go right, most people at the wedding never even see.” How about my parents go up to the front to light the candle…and there are none? The Groom forgot to delegate the small matter. Now THAT belongs on America’s Most Pathetic Videos or something. I’m going to hop off. My blood pressure is rising. At least you now feel better, your wedding replay less ridiculous than mine. Lol– I totally get it. I’m sure the Mr. appreciated your generous, forgiving nature. Congratulations on the wedding Diahann! I can understand the come-down after such a big event. Thank you, Andrea! Writing about it definitely allowed me to process and release. Aww, beautiful piece! I’m sorry about the depression you’ve had to deal with! Although I’ve never been married, I know the feeling of being super excited about something/really enjoying the moment and then feeling the loss of that time afterwards. Like I’ll try to cling to details with my memory, only to feel some things fade and it can get me very down. Hope your down time passes quickly! Thank you- yes- that’s totally it! to try to keep it close to you the rewinding and replaying before they disappear into the past because it inevitably will. Thanks for writing this. It resonates with me not just about weddings but all kinds of big projects and big days. I don’t think we talk much about the lows that inevitably follow the highs, but I’m well acquainted with them. And Congratulations!! Thank you, Jenn! Yeah- I definitely have felt similarly after doing a storytelling event or performance. It makes me think of the creative babies that we become pregnant with and hold so much internal space for and then feel empty after we’ve popped them out because that space that was filled within is now vacated. Our wedding was definitely a co-creation for the two of us. I love that you renewed your vows and that you absorbed everything and everyone wonderful in. You’re right, our 25-year anniversary can be our “take 2” to make sure we make time for all that. Thank you for the tip :)! I haven’t known if to comment about this was appropriate and I don’t want to be a drag in the discussion. Marriage is hard for the non-traditional woman. But no matter what, I wish you all the luck, blessings, love and happiness for you and Michael, Diahann. You deserve the best of everything. Thank you, Kate. I’m so glad you shared your story about what your experience has been like. I am sure you are not alone in having those feelings, which aren’t discussed much. but I bet you by writing about them here you are giving words to someone else’s experience/giving them permission to own their feelings too so thank you for that. Always great to hear what you think and feel. I know you aren’t blogging anymore, but I’d say you have a pretty rich personal essay in you on this were you compelled to write. Thanks for your thoughtful reply and encouragement, Diahann. I am so far (after reading your post and also dealing with the subject of marriage since I was a girl in one way or another) compelled to meditate on the story/stories I have been telling myself which are blocking me from experiencing joy in my life. I am trying to confront the stories I am clinging to which have kept me a perpetual victim of the “marriage blues”…or whatever else… and not for “consolation” as much as wanting to become more honest with myself so I can grow. I like what you said on Chloe’s blog, about figuring out what our commitment and focus is and going for what pulls us. Letting the rest go. And I like your “new paradigm” co-creation idea, and your openness to exploring the new day aware of your past anxiety and facing those feelings honestly… I think that’s how you’ll be able to redefine marriage on your own terms… with awareness of the fears and emotions and then finding out what your real story is which is unfolding and not one thing that can be pointed at. This a really beautiful gift you have writing. It’s helped me a lot… Thank you again for sharing your work. I love that you are unpacking the stories and figuring out which ones you want to keep and rewrite or toss. Esp fascinating to me is the stories that we've inherited or have just been fed and didn't even know we'd digested but have nothing to do with what is authentically true for us or what we want. So kudos to you for doing that brave work. Yes- for me that new paradigm is the only way cuz the established themes/roles/expectations just won't work. Creating a new paradigm has its own set of challenges for sure – and sometimes it would be easier to just slip into the already pre-set grooves established by society- but I'm pretty sure that would make me very unhappy. “But when you look at yourself in the mirror, I hope you see yourself. Not one of the myths. Not a failed man – a person who can never succeed because success is basically defined as being male – and not a failed goddess, a person desperately trying to hide herself in the dummy Woman, the image of men’s desires and fears. I hope you look away from those myths and into your own eyes, and see your own strength. You’re going to need it. I hope you don’t try to take your strength from men, or from a man. Secondhand experience breaks down a block from the car lot. I hope you’ll take and make your own soul; that you’ll feel your life for yourself pain by pain and joy by joy; that you’ll feed your life, eat, “eat as you go” – you who nourish, be nourished! If being a cog in the machine or a puppet manipulated by others isn’t what you want, you can find out what you want, your needs, desires, truths, powers, by accepting your own experience as a woman, as this woman, this body, this person, your hungry self. On the maps drawn by men there is an immense white area, terra incognita, where most women live. That country is all yours to explore, to inhabit, to describe. If a woman sees other women as Medusa, fears them, turns a stone ear to them, these days, all her hair may begin to stand up on end hissing, Listen, listen, listen! Listen to other women, your sisters, your mothers, your grandmothers – if you don’t hear them how will you ever understand what your daughter says to you? And the men who can talk, converse with you, not trying to talk through the dummy Yes-Woman, the men who can accept your experience as valid – when you find such a man love him, honor him! But don’t obey him. I don’t think we have any right to obedience. I think we have a responsibility to freedom. are a woman who judges. Kate, thank you for sharing this. I have never heard it before and I really and resonated with her words. It’s not something that you can just pull one quote from. I’m going to have to look up the whole speech. And I am really honored that you feel that I’m that kind of support for you. Know that you do the same for me. Aww… thank you. And also for the link to the speech! Btw- I didn’t realize you were still blogging. I will be checking out your work on Tabby Ren Elle’s blog soon. I’m not sure I am blogging! I don’t know what to call it, maybe the “mother-tongue”??? something in my usual subversive voice tho. 🙂 but I thank you. It’s “Tabby” (for Tabitha) Ren Elle btw, Ren is the phonetic pronunciation for the Chinese kanji that means “human being” and it was given to her by one of her grandfather’s who was Chinese. The speech is intense but heartening. “Nourishing” and candid. I aspire to such things. Hi, Tabby, yes of course I remember you. Thanks for giving me the heads up about Kate’s work. I will definitely check out her recent pieces on your blog. And thank you for the good wishes. We are definitely loving up the love together. Can’t believe it’s already been two months. Hee hee! “loving up the love” 🙂 That’s a sweet phrase. I’d say keep doing what you’re doing! It sounded from your many comments and your original post that you were settling in nicely. Being married 3 x and each wedding was full of hope and beauty, I worry to say too much. When Mom was cleaning out his sock drawer the real love and comfort was found: a stack of cards in envelopes tied with a shoe string. They were 4 more years of cards, Valentines, Easter, Thanksgiving, birthday, Christmas, New Years. He had said, “Only open each on the day it is marked.” When she got to 4 years later we knew it would have been their 50th anniversary. We also had been witnesses to her opening the cards so we planned a family gathering at a nice hotel, a long table of guests including her only sister, husband and our cousins. We picked Mom up to take her, she was told to bring the card so she wasn’t surprised we were going to eat out. When she saw my 3 kids, my brother and wife’s 3 kids and her sister and 2 of her 3 kids plus one grandbaby (my daughter’s) she was overcome with emotion, Diahann. The Golden Anniversary card was beautiful and my Dad wrote lovely things. He also included a note for us. It said he loved his children and grandchildren and “all the future possibilities.” To think of his sneaking around when he knew he only was given 4 months to live is amazing of his forethought of my mother. That is the example of Love. As she was leaving she said something about Dad liking our party. She felt his presence. Wow… I loved this story. It sounds like your parents loved each other very much and I love that she continued to hear from him all the way through to their Golden even though he was no longer on this earth. And, hearing him talk about his children and grandchildren and the future… we read a lot about all the hopefulness at the beginning of the journey but not at the end, so thank you for that and for sharing so generously after. Your parents’ story.. what a happily ever after ending.